Two sunny and stormy days ago, I went to be my little sister's cheerleader at one of her many tennis matches. Really, I just sat on the sidelines and attempted to look pretty. No, I'm just kidding! As you've most likely already twigged, this is what I wore. I donned this stunning animal print, peplum top which I acquired from a shop called 'Soho Market' in a local shopping centre, Swords Pavillions, for a tiny €10 in their sale, which I'd recommend checking out if you're in the area. I paired it with a simple black miniskirt and gold sandals. I am currently crazy for this egyptian styled necklace, which, if you follow my blog, you probably recognise from my last outfit post. I found the green stones really complimented the different shades of prints and accessorised with a small, envelope shaped, purple clutch and an edgy orange bracelet. Let me know what y'all think in the comments! This outfit is amazing! You look gorgeous! I absolutely love your top. I love your hair, I absolutely love that kind of hairstyle, so bold and chic. And the outfit is great. Love how you found this top that combines the leopard print and peplum trends! I too am loving the egyptian style necklaces. Hope your sister did well in her tennis match! gorgeous top! and I love the jewel toned accessories! Cute leopard peplum!! :) Your blog is awesome-just became a member/follower of your blog. I hope you'll follow me back and we can keep in touch. Happy Blogging!!! Thank you for the follow, and now I'm following you too. I found you on IFB and followed via GFC, Bloglovin, Twitter and Facebook. 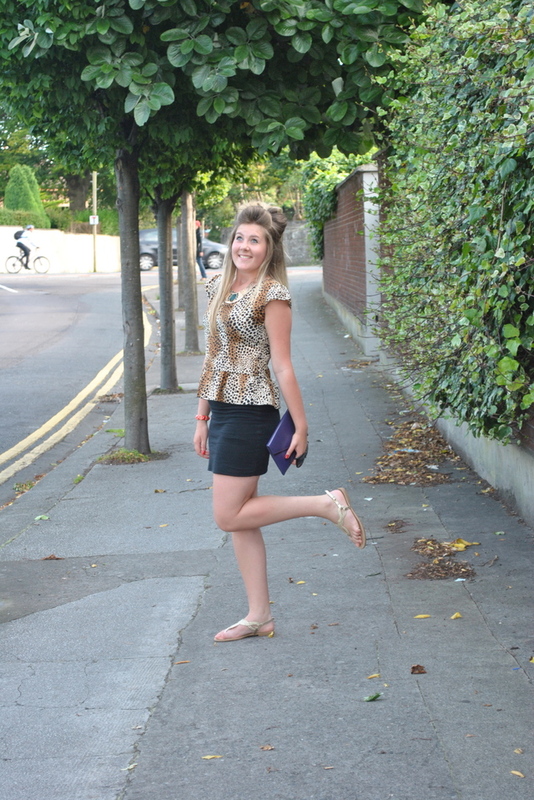 love anything peplum right now, and if it's leopard print, even better!!! Hi pretty! It's Sara from IFB! I love your blog and I love your leopard print, I'm crazy for it! haha I invite you to check my blog. Following you on GFC and Bloglovin! Hi Hannah, I saw your message on IFB! Thanks for following me on bloglovin! I am now 'stalking' you on Bloglovin' too! Yay! Keep up the good work! Lots of love! This second one is so cute! It's christine from BASI ^_^ Oh! I didn't even realize that you were not on the member's page in the blog! So I added you! Thanks for tweeting and helping promote BASI- did your read the most recent post from sunday? GAH- trafficking right in Boston! That top is so cool and I really really like your necklace!! gorgoeus outfit! I love the bold top and the statement necklace and your hair is so gorgoeus! Love the top. Peplum is a must have for fall and you look so cute! !